Most people are entirely dissociated from the fact that the animals we breed, harm and kill are capable of physical and psychological feelings of pain and pleasure. When we hand over our money at the shop till for the body part of another animal, we create a demand for violence. To divorce ourselves from the violent consequences of our actions, we suppress our awareness that the animal whose body part we are buying could feel, or that he or she had a complex social and emotional life, including a relationship with her children. We conveniently forget that he or she had interests and preferences and, as farmers and slaughterhouse employees have repeatedly confirmed, their most ardently expressed preference was not to be harmed or killed. We like to think of ourselves as decent people, living ordinary lives that are of little consequence to anyone else. Every day each one of us gets out of bed, we shower and dress, eat, work and socialise with no conscious awareness that we are harming anyone. In fact, many of us who connect with companion animals or wild lives imagine that we ‘love’ other animals. We don’t think about the fact that are our many of the products we use in our morning ritual such as our shower gel, shampoo, body lotion and cosmetics contain the remnants of the slaughterhouse. We rarely think that the clothes and shoes we dress in were once the skin, wool or hair of someone who wanted to stay alive. Most of us think believe it is wrong to inflict unnecessary harm on others; and most of us appreciate the value and preciousness of life. If we came face to face with them, few of us would fail to be moved by what they are forced to endure during their short, miserable lives, or by their terror at the end of their young lives in slaughterhouses. Faced with this reality, who among us would justify the demand their violent deaths for a woollen jumper, an egg, a piece of cheese or flesh, when we could so easily use a plant-based alternative? We don’t let ourselves think that the food on our plates was a feeling being just like the cats and dogs we love and share our homes with. In fact, we abhor the practice of eating cats and dogs and we comfort ourselves by attributing such a violent act onto the cultural differences between us and other people or other places. Yet the practice of eating pigs, chickens, fishes, goats, cows and sheep is no less violent because they feel just the same as the cats and dogs we love. We don’t connect with WHO the animals were before they became the dismembered body parts and secretions that we call food and clothing. Most of us either have no idea of the harm we inflict on them for these seemingly innocuous parts of our daily, non-vegan lives, or we lack the courage to face the consequences of our actions. These items that we take for granted every day such as the food we eat, the clothes we wear and the products and cosmetics we use, have a history that stretches all the way back to someone: someone with feelings, someone’s mother, someone’s child, someone who valued their life, someone who didn’t want to be used, or harmed, and didn’t want to die. Someone, who if we met them face to face, we would never choose to harm. Harming someone defenceless and innocent is anathema to most of us. It goes against all the values that we claim to hold dear like justice and fairness. It is particularly unjust because there is not a single ingredient in their lives or bodies that we need for our wellbeing. It is these ‘someone’s’, the victims of our human use, who are rescued and live at Eden. Eden Farmed Animal Sanctuary CLG is a company limited by guarantee established on a not-for-profit basis. Registered in the Republic of Ireland. CRO number 559223. Registered Office: Chamberstown House, Slane, Meath. 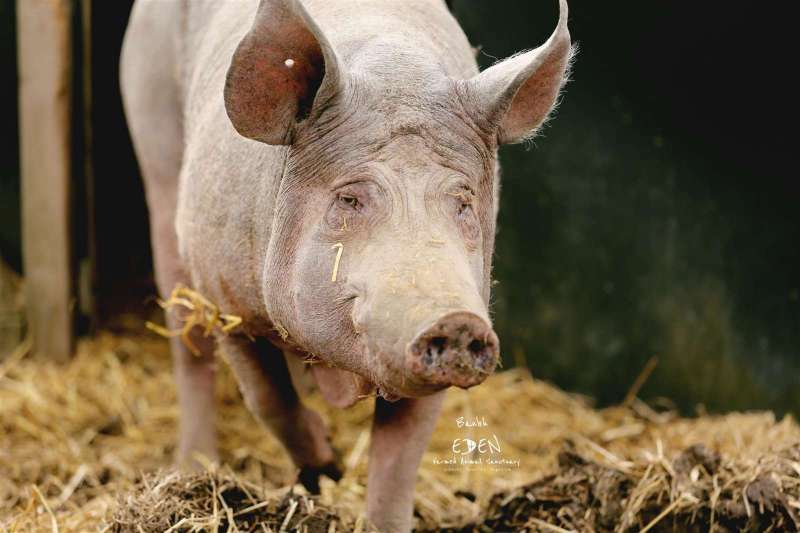 ®Copyright Eden Farmed Animal Sanctuary 2008-2018. The content of this website is subject to copyright and may not be altered or reproduced without permission.